RedLynx revealed quite a twist for Trials Fusion with this great trailer announcing 40 new tracks and a flamethrowing unicorn. The content will be available as Awesome Level Max DLC and part of the Trials Fusion: The Awesome Max Edition, coming on July 14th. LOS ANGELES – June 15, 2015 – Today, at the Electronic Entertainment Expo (E3), Ubisoft® announced Trials Fusion®: Awesome Level Max, a downloadable expansion pack that includes an eccentric mix of brand-new tracks, characters and in-game items, and Trials Fusion®: The Awesome Max Edition, a new bundle including the main game plus all of the title updates and downloadable content packs released. This new content will be available worldwide on July 14 on Xbox One, PlayStation®4 computer entertainment system and Windows PC. Trials Fusion Awesome Level Max is the largest content update in the series and introduces 40 tracks plus a wide variety of new garage items, achievements, track challenges and objects for the track editor in two separately themed events, The Awesome Adventure and RedLynx vs. All-Stars. 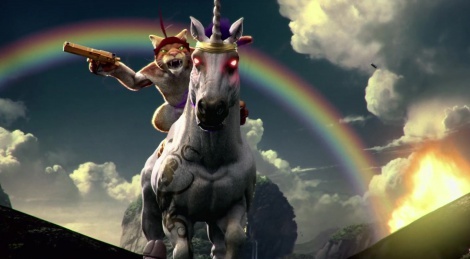 The Awesome Adventure is a unique Trials Fusion experience that transforms your character and bike into a gun-wielding cat riding a flamethrowing unicorn. The Awesome Adventure also includes eight new classic Trials tracks, various mini-games and an entertaining soundtrack for the ride. RedLynx vs. All-Stars is a collection of more than 20 new tracks pitting RedLynx’s own track creators against the very best track creators across the world. The development team has collaborated closely with the fans over the past year, and half of the RedLynx vs. All-Stars tracks have been created by the best builders among the Trials Fusion community. 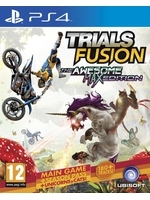 Trials Fusion: The Awesome Max Edition brings the full experience of Trials Fusion in one package, available all at once, combining all of the new content introduced in Trials Fusion Awesome Level Max, plus all 10 title updates and the first six add-on content packs previously released. Trials Fusion: Awesome Level Max and Trials Fusion: The Awesome Max Edition will be available for download on Windows PC, Xbox One and PlayStation®4 system. Developed by RedLynx in collaboration with Ubisoft’s Shanghai and Kiev studios, Trials Fusion has sold over 1.7 million copies to date and offers players an unlimited array of obstacles and challenges as they race against the clock to set track records. Trials Fusion is continuously being updated to add new features and content, as well as track editor items to make the game the ultimate racing experience. In addition to these updates, the game’s Track Central contains almost 60,000 user-generated tracks with new submissions coming in on a daily basis. For the latest information about Trials Fusion, please visit trialsgame.com. Yes, and we need gun totting kitty cats riding a fire breathing unicorn with rainbows in the BG ... LOL :D ... oh Ubisoft. That's copyright infringement right there, can't just use buffcat however you want.